So you want the carrying handle still attached with an ACOG on it? 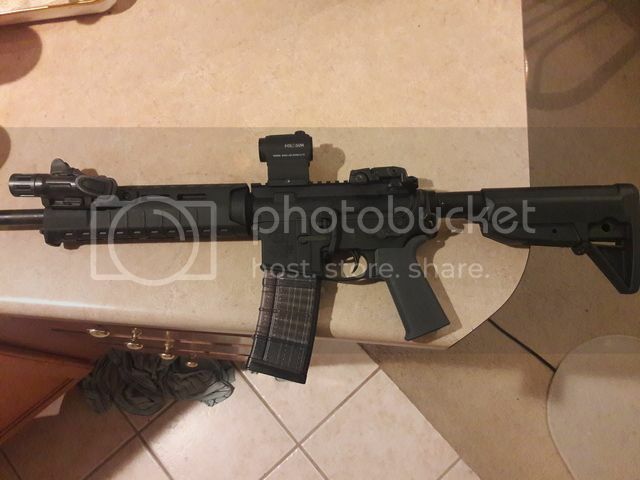 I think the reason why that set up existed is because of the period it was in with flat top ARs only just starting to become the norm and accessories for ARs account for the carrying handle. Oddly enough, the rifle in the cover artwork has a detachable carry handle. There's a reason for that, though. If you decide to use a carry handle, you have your standard iron sights to use as well as the ACOG and it's iron sights if you want. The only issue is that there's a ridiculous amount of height over bore and parallax margin with the optic in that configuration. I toyed with getting an ACOG TA01NSN, but even as the cheaper alternative to the TA31RCO, it's still expensive, even on eBay. They did this in the 2003 SWAT movie. Looking back, I wondered why? I think nowadays, if you want a sights to close range alongside a long range scope, you can doctor a red dot on top of an ACOG or scope or offset sights. The weapons in the movie were configured after what actual LAPD SWAT used at the time and 2003 was when the accessory market had really only started to take off. Even ACOGs were relatively new at the time, with the military only beginning to use them on a large scale in or around 2000. In fact, the ACOG was originally purpose-built to affix to carry handles. At that time, piggybacking optics had yet to come into fashion. A story I heard (not sure if it's true or not) was that Trijicon started making ACOG/red dot combos after seeing a soldier's ACOG that he had simply glued a red dot sight on top of. The configuration is a bit dated today with all the multi-magnification, piggyback, and offset options, but like fixed carry handles and the old triangular A1 handguards, it still has its charms. In 2003 there were mounts for fitting Docters to ACOGs made by KAC, but it was still an experimental thing and not really done by anybody yet on a large scale. ACOGs do have iron sights, but they are kind of terrible only being useful at very short ranges due to the massive aperture and post and terrible sight radius. Trijicon would not make their own red dot and ACOG mounts until 2007. According to the official Trijicon history page, ACOGs were officially adopted by the US Special Forces in 1995, the USMC in 2004, and the US army in 2007. Apparently the first people to use them were GSG9 who started fitting them to SG550s in 1993. So if ACOG didn't have doctor red dot mounts until 2007, does that mean the doctor mounts we saw in The Lone Survivor is anachronistic? Docter sights fitted to ACOGs with non-trijicon mounts were around back to around 2003-ish. What didn't come out until 2007 was the Trijicon RedDot, their own mini reflex sight for mounting onto ACOGs. In 2005 you could get Docters mounted on ACOGs so this isn't necessarily anachronistic. All that being said, I believe that the sights that they were actually using on their ACOGs were JPoints with those mounts with the metal protective wings (this can be seen on Danny Dietz's Wikipedia page image). The JPoint mounts were made in 2002 at the request of FBI HRT I believe. Trivia note, the Trijicon RedDot released in 2007 is just a licensed copy of the JPoint that costs more money. Alright guys, this is what my current go to rifle looks like. It's a Smith & Wesson M&P 15. One of the early ones when they first came out but I've since put a bunch of other stuff on it. For the price, it works. I plan to get a Primary Arms to replace it. I hear despite being made by the same company, it's reported to be better. I don't plan on using this optic for anything but point and shoot at close ranges under 50. When I got this, I noticed it was so far off zero that my iron sights hit better at 50 yards. There's the mindset that you should spend as much money as you've spent on your rifle for an optic because it's part of the tools that's meant to protect your life and if you have a budget one, it'll fail more often than the expensive ones like Aimpoint. So in the future, I'll be investing in the more expensive options.